← Where do you chose to be buried if you are one of the richest men in the world? 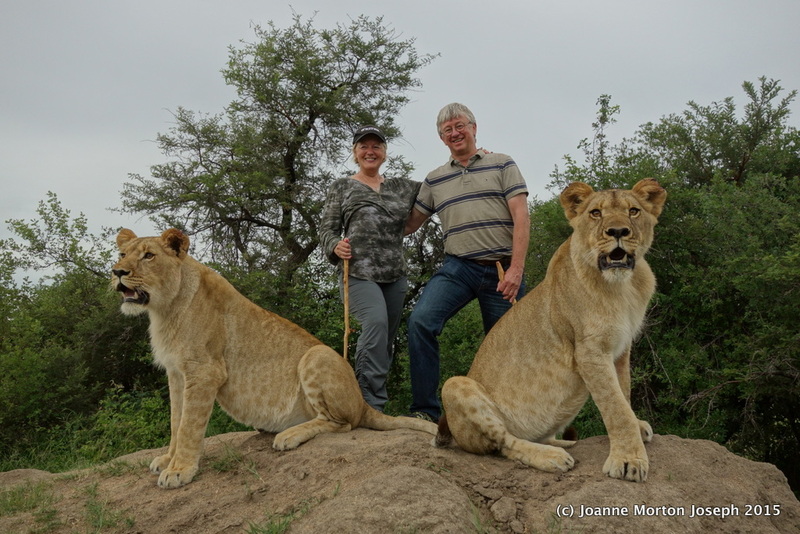 Tim and Joanne with two 19 month old lions – you might think they are posing, but the truth is they are eyeing two giraffe off in the distance. Their hunting instincts are kicking in. Oh how I had been looking forward to this day. I mean, come on, an opportunity to walk with the lions! How does one possibly top this? I honestly can’t remember if the bus ride was long or short to get there, I was just so excited to arrive at Antelope Park. Yes, these are extras, and a fee applies to each one. Here is the current price list. And I know some of you are interested in/concerned about the health and well-being of the animals in this program. At Antelope Park, they have teamed with several top organizations to ensure that the animals are all well cared for and treated humanely. 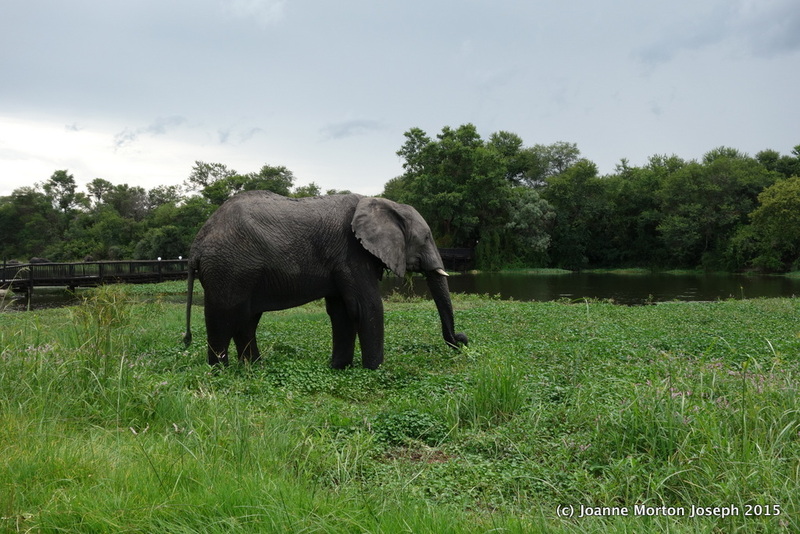 They have won numerous awards for conservation and care of their animals. 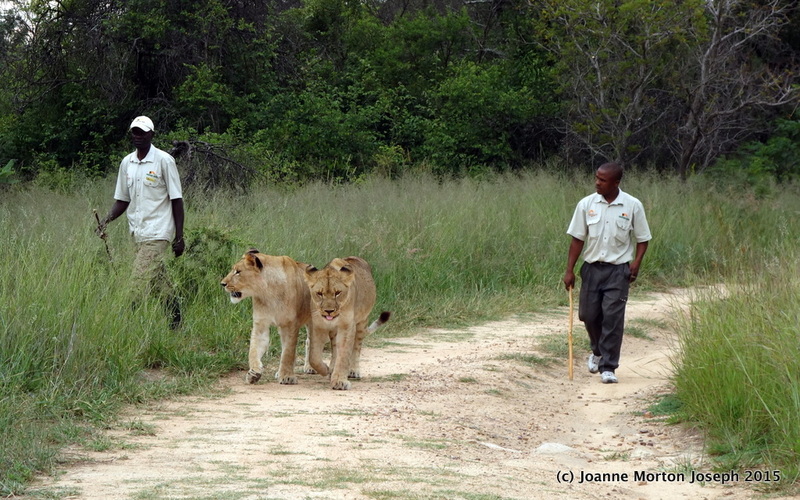 Tim and I had pre-paid to walk with the lions, but after seeing a brief introductory film upon arrival, we soon agreed that we also had interest in the lion cub viewing, night encounter where we went on a “hunt” with adult lions from their breeding program, and the lion feeding. First an introduction to the facilities. I was immediately in love with the place – large open property, sweeping panorama views overlooking a marshy river. 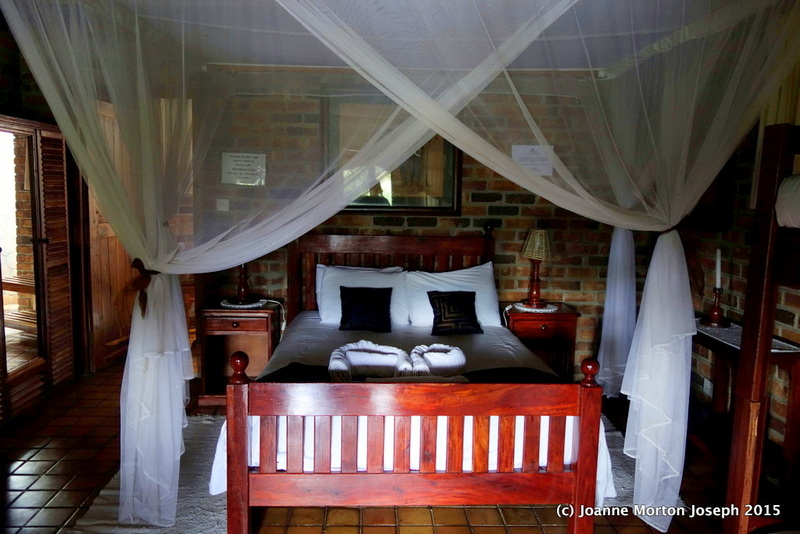 Cross over the bridge to get to several water-front cottages including family units and the honeymoon suite. 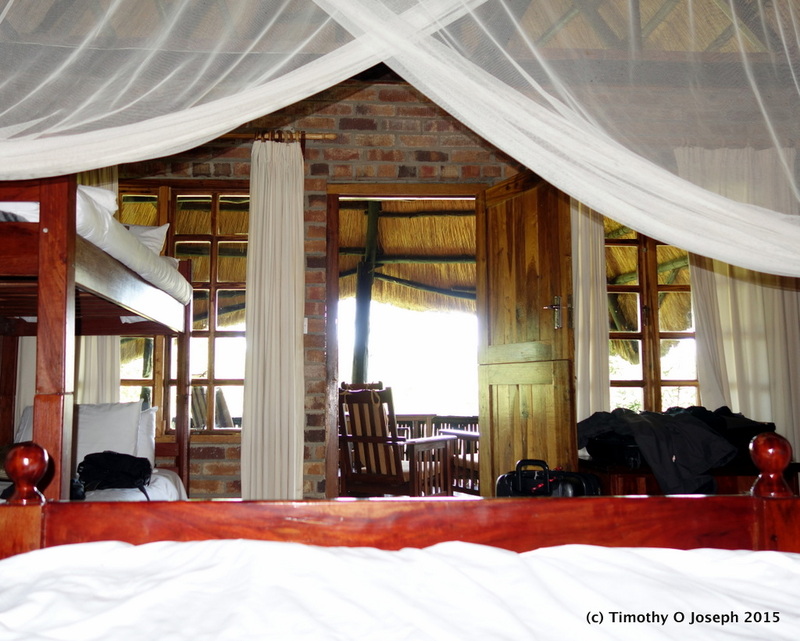 We were in River Lodge number 3 which we loved. Some of our group were in tents, but they too were roomy and had attached full plumbing bathrooms. 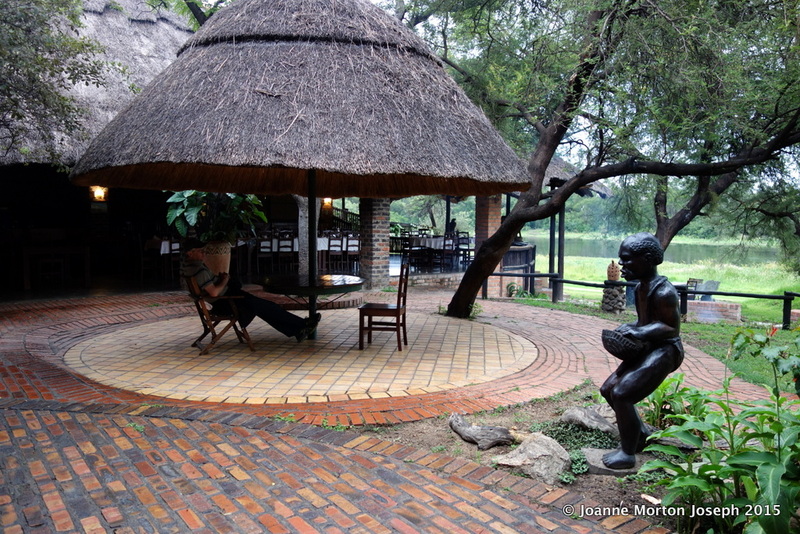 The main lodge, has a reception area, large outdoor meal area where a wonderful buffet is served three times a day, covered eating area, gift shop, lounge/bar and more. 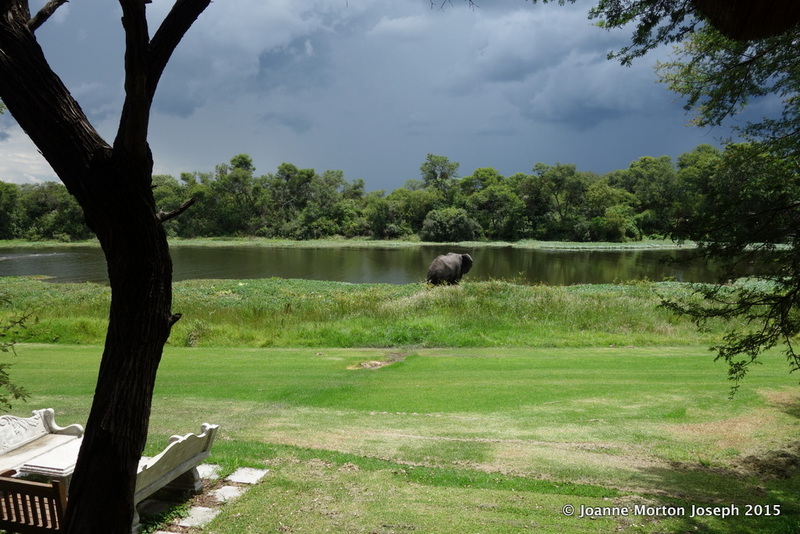 From the raised eating area you look out onto an open grassy area where resident elephants stroll by, munching on green grass as they go. After getting settled in, and signing up for the activities we each were interested in, we were given a schedule. We had a LOT to squeeze into our short one night stay. I have already made a recommendation that a minimum of two nights be spent here as there are several things we would have loved to include after getting feedback from other members of our group. Top two that I would add: horseback riding – they got up very close to animals in their natural setting (be sure to wear long pants) and the lecture about ALERT and their breeding program. 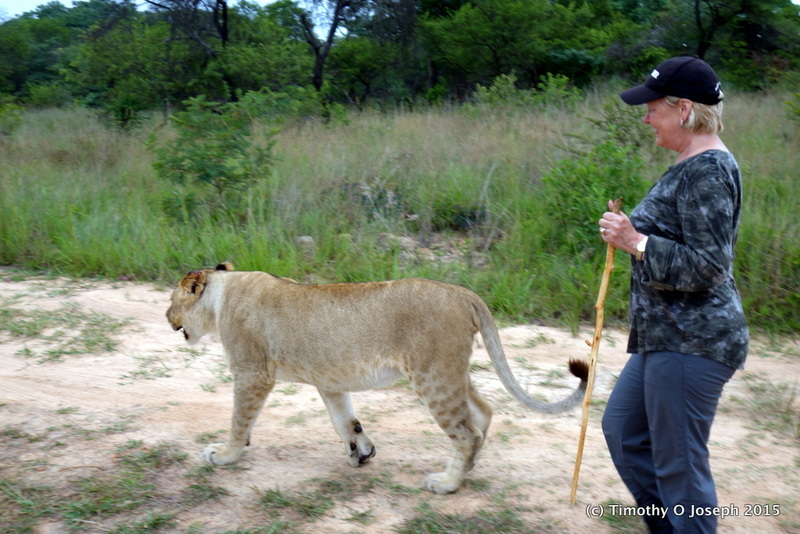 But I am still thrilled with what we DID get to do, starting with walking with the lions! Use stick correctly, not for hitting the lions! And just in case you are wondering – NO, the lions are not drugged or tranquilized in any way. 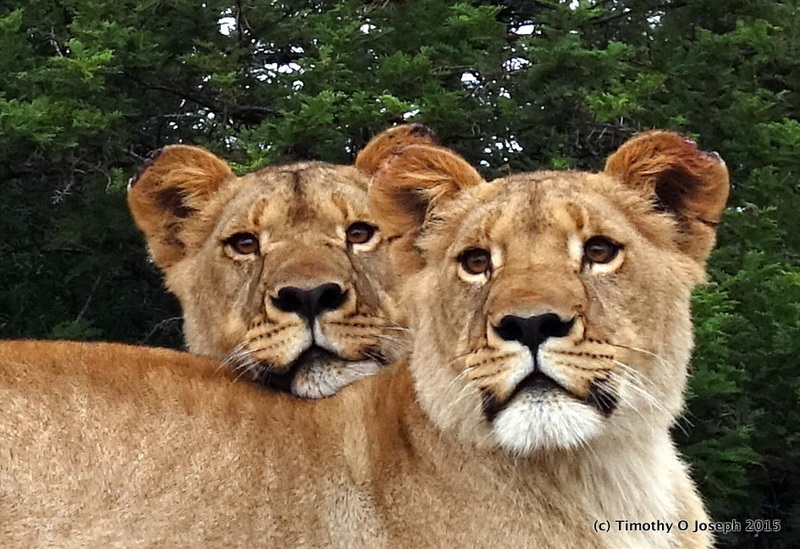 Normally this is the 6 month – 18 month old lions that are used in the “walk-with” program, but we were lucky enough to get two 19 month old lions. So, after a few of us quickly stripped off anything “dangling” like back packs, camera bags, scarves, etc. we each chose a “lion stick”. Really a simple walking stick, but the lions have gotten use to the idea that whoever has the stick is in control, and a leader in the pack. They also seem to respect us if we are higher than them, so at no time were we to get down lower than they were. For example if they are standing, so are you. If they are lying down, you can get down on ONE knee (never both so that you can get back up easier and quicker) if the lion gets up. Two groups of 9-10 people set out in the back of pickups to go meet our lions. 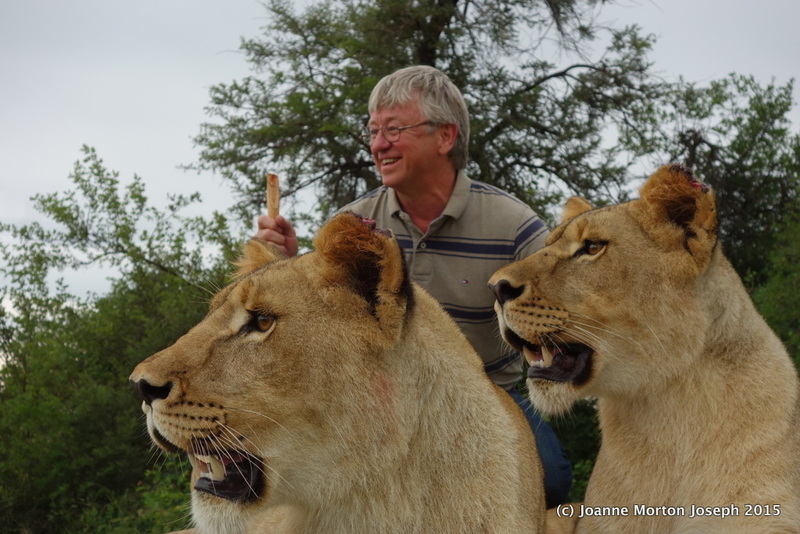 I was seated next to one of the lion handlers, Markson and was able to ask him a few more questions as we drove toward the lion compound. He had been working with the lions for 15 years, and his favorite was a large male names Mufasa, who unfortunately I never did get to meet. 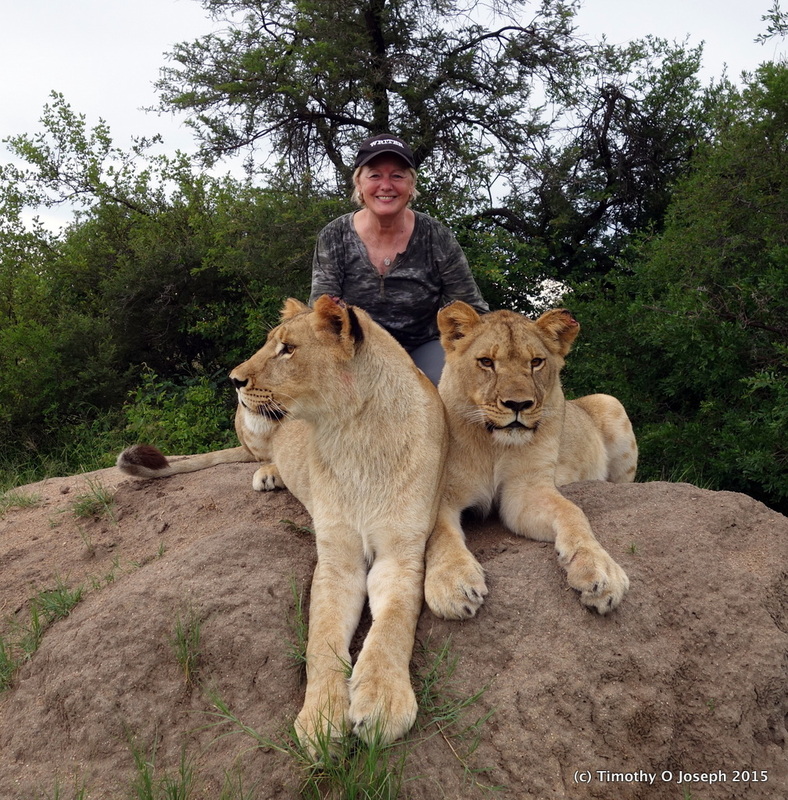 Upon arrival in the neighborhood of the lions, we unloaded and our two handlers went off to find the two lions our small group were to walk with. They were both 19 months old. Normally they are removed from the “walking” program at 18 months, but both of these beauties had been extended, just for us. I found out that lions become sexually mature between 2-3 years old, but do not become fully grown until they are 4-5 years old. 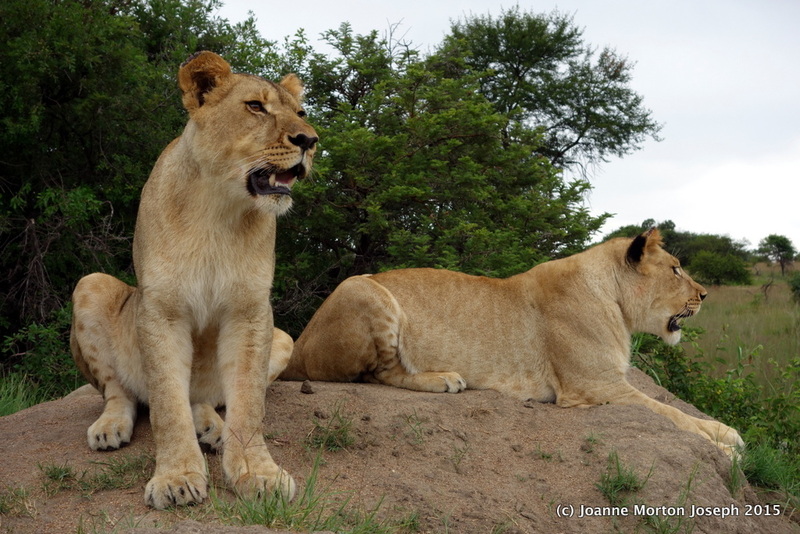 The lions we were with were teenagers – frisky, and just learning to hunt on their own. Our two lions being brought to join us for a walk. 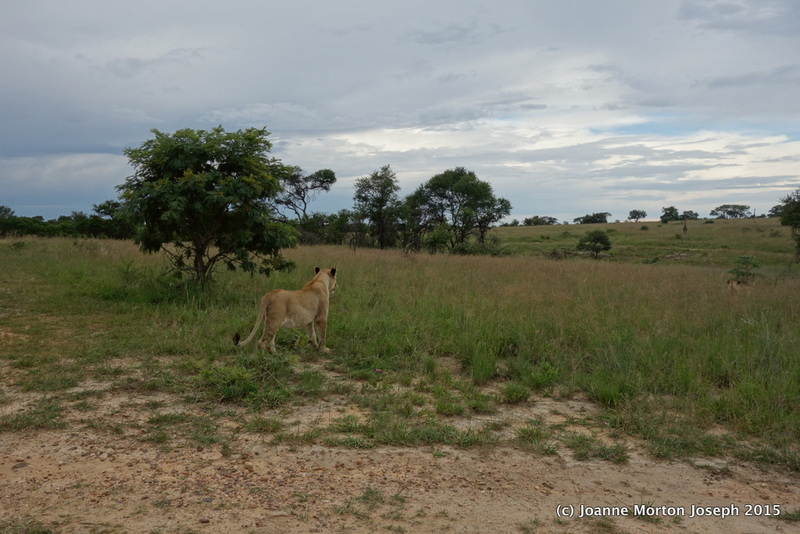 Two lions per 10 people, plus two handlers and our guide. Initially we simply follow them along this dirt path. A couple of times they get side-tracked after spotting several giraffe, or other animals in the wild. They are starting to learn natural hunting skills and that is encouraged. ALERT has the goal of breeding lions and returning them into the wild. The ones used in the walking program, will never be “wild”, but can be used in breeding programs, will be allowed to raise their own offspring, and their youngsters will hopefully fully integrate back into a totally wild environment. There are four stages in the breeding program. We witnessed stage 1 and part of 2 only. After a while the lions climbed up on to a large rock. After they settled down, we were invited to approach them from the back, to pet them, and get a few photos. A couple of our group members were a little timid at first, but soon warmed to the idea, and the opportunity. Perched on a rock, just waiting for us to join them..
Thankfully, I am so at home with the big cats. Tim too seems completely at ease. I think they can sense if you are comfortable with them. At one point I just reached down (after asking if it was OK) and held it’s tail as we walked along – awesome! 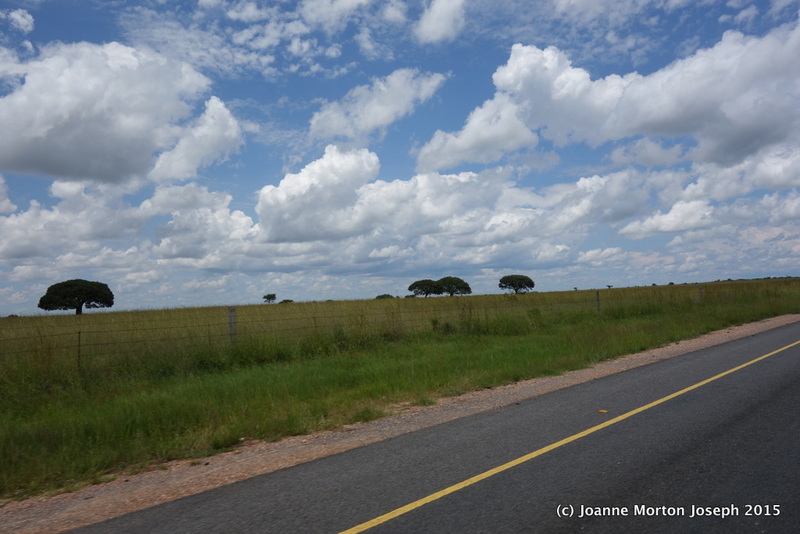 I have sooooo much more to share with you about our time here at Antelope Park, but this post is already getting quite long, so I will close for now. Stay tuned for my next post to find out about trying to find two lost lions, playing with lion cubs, and feeding the lions. 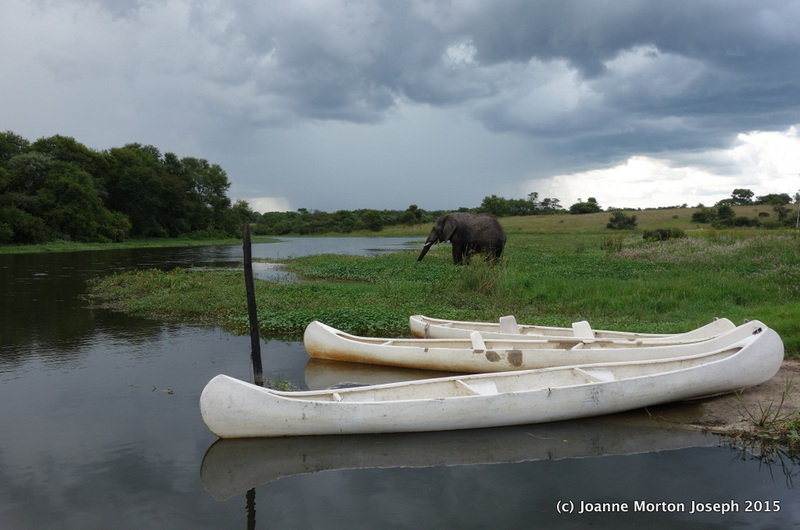 Really, if you have Southern Africa on your wish list, make sure you consider adding a stop here to your itinerary! Gratitude Moment: Today I am grateful for having one of those “once in a lifetime” experiences. I have always had an affinity and a love for cats. This exceeded my hopes and expectations. This entry was posted in Africa, Zimbabwe and tagged ALERT, Antelope Park, Elephants, hunting, Lions, Night, Photography, safari, Travel, Walk with lions, Zimbabwe. Bookmark the permalink. Wow!! What A Wonderful experience it might be. I just loved the pictures & reading everything about your experience. Amazing!! It is hard to capture all of the experience in pictures, but it was truly memorable. I’m still feeling excited about it! Oh my goodness, that is awesome!! I now have walking with the Lions added to my bucket list 🙂 Thanks for sharing! Yay! Another convert! I am shouting from the rooftops how much we enjoyed this. Another wonderful blog. It’s a highlight of our day to read about your adventures. Thanks for sharing. Ahh, Gaye, thank you. Hope all is well with you down under! I can hardly imagine anything more thrilling! Yes, they are magnificent creatures. Thank you very much for “taking us along”! I enjoy having your company. What a wonderful adventure you had. Unbelievable. Thank you for sharing it with all of us. Sharing all of this is a huge part of the joy we get from traveling. Thank you for being a part of our adventures. Yep, pretty amazing day and night.